During the period of the Nazi regime (1933-1945), a hidden accommodation of the Bekennende Kirche (BK, engl. : „confessing church“) was set up in here. The BK had been founded by Protestants who defended themselves against the increasing bringing into line the Nazis pushed on in the case of the German Protestant church. In the cellar of the building, BK’s supporters launched a secret printery, with regard to the working conditions comparable to the Schmiedel printery in the immediate neighbourhood. BK’s printery produced first of all papers and flyers denouncing Hitler’s regime. Heinrich Held – a Protestant priest – and further members of the BK worked in this building. 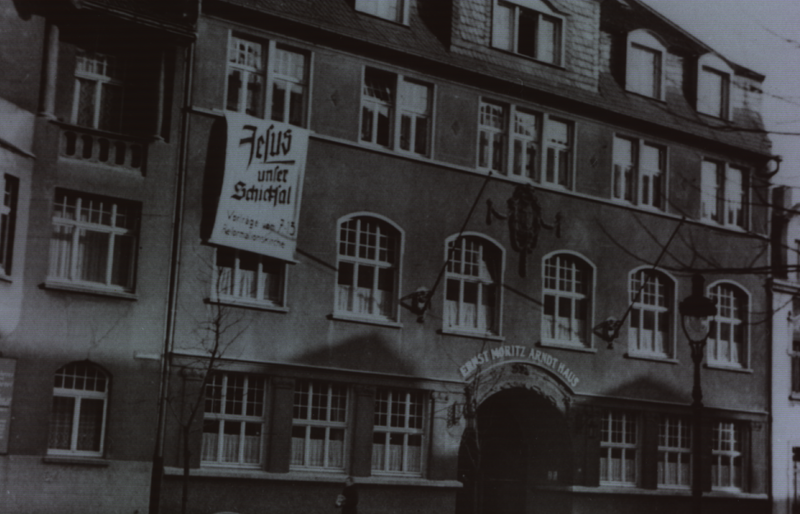 A historic picture showing the Ernst-Moritz-Arndt-Haus. This photograph was offered by the Essener Haus der Geschichte / Archiv Ernst Schmidt. In 1930, Held was elected priest in Essen-Rüttenscheid. On behalf of all priests of Essen, he protested soon after the NSDAP’s rise to power against governmental inspectors put in the Protestant church in an illegal way. Because of his critical attitude towards the fascist regime, a ban on speaking was imposed on Held. In conjunction with Gustav Heinemann and the priests Friedrich Graeber and Johannes Böttcher Held saved the lives of about 60 Jews who hide in the cellar of bombed houses till the end of World War II in 1945. Held cared for their catering even when Essen had been declined to be „free of Jews“. In all but name, Heinemann, Held, Graeber and Böttcher opposed the Holocaust – the planned mass murder of millions of Jews led by the Nazis – with their courageous and humane behaviour. 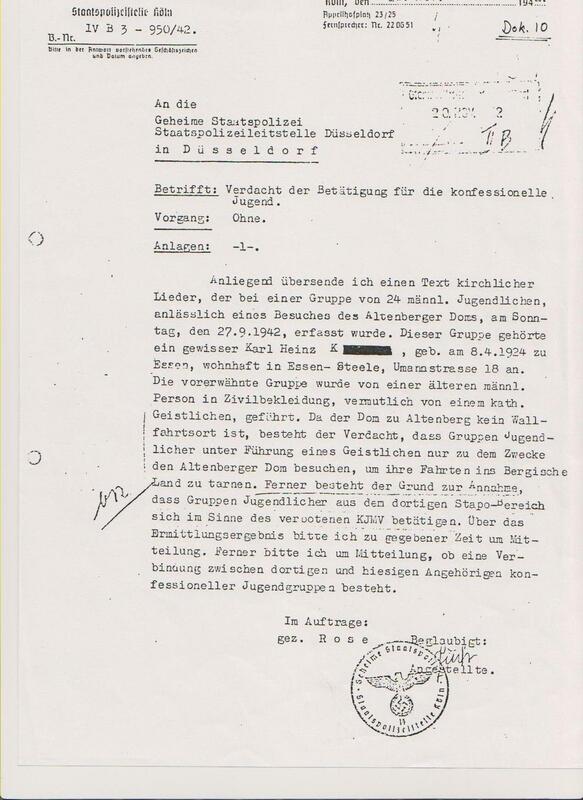 This document drawn from the collection of Horst Zimmer proves how pitiless truely christian people were persecuted by the fascists. The church’s relationship with the Nazi regime is still contentious. In 1933, when the fascist movement rose to power, Hitler presented himself liberal towards the Vatican. Although, his demonstrative acceptance concerning the Vatican could have been just strategic. While pretending to act in a tolerant manner regarding christian issues, Hitler could distinguish himself from the communist movement, denouncing religion in general as „opiate for the people“. This way on, Hitler crawled to the bourgeois part of the political spectrum. The so called Kirchenkampf (engl. : „struggle of churches“) left its mark on the early Nazi period. Foremost, the fascists tried to bring both churches with a high number of members into line. Within this context, many christian believers took a stand against the Nazi regime, refusing to let their church be undermined by fascists. In opposition to the Deutsche Christen (engl. : „German Christians“), the aforementioned BK was formed, lodging an objection against Hitler’s supporters. The Deutsche Christen however backed offensively the Nazi ideology. All in all, there is one crucial fact probably to be taken for granted: both great christians churches as institutions having their roots in a humane starting point, based on the lessons teached by Jesus, failed in really withstanding the Hitler fascists. Nonetheless, there were several persons – especially within the Bekennende Kirche – combating Hitler’s agenda, questioning the Nazi’s racist ideology. Those who fought against Hitler, striking up their protests against the dictator’s aims too often had to pay with their life or personal freedom. 1) Join the parish rooms and ask for a person you can have an interview with. 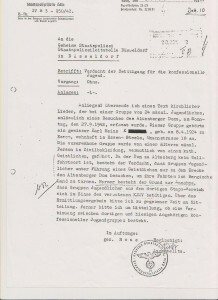 If you managed to find a suitable person, pose questions concerning the engagement of the Bekennende Christen who refused to back Hitler’s regime in 1933. Try to find out in which manner this topic is examined within the parish. Are there any papers, focussing on the BK, or probably a monument? Request the opportunity to record the conversation in order to employ it later on. Hence you can make use of the given information while preparing a blog entry. 2) You have already read about the flyers which were produced inside the parish rooms during the Nazi period. Try to formulate such a flyer by yourself, denouncing Hitler’s intentions and the racist ideology of his regime. If you like, you can express your brief text in christian ideas, such as the equality of all humans beings in the eyes of God. You may also refer to the ten commandments („You shall not lie“) in order to question the Nazi’s racist propaganda. It is possible to offer the finished flyer to the parish. Probably, it may be exhibited in a showcase or there’s a confirmation class working on this subject.